The patent-pending Freeze Sleeve is an innovative, American-made product that converts a modern compression sleeve into a clean and convenient cold therapy device. Designed for both men and women, the Freeze Sleeve comes in six sizes, and can be used for 360 degrees of compression coverage on different areas of both the arms and legs. For athletes who’ve struggled with the mess and annoyance of traditional ice bags and wraps, the Freeze Sleeve offers a simpler, more effective, and more comfortable alternative. Simply store the sleeve in your freezer (minimum two hours, no maximum), then—after a workout—slip it over the desired treatment area for 20 minutes of cold therapy. There’s no need to prepare an ice pack or fidget with its placement. 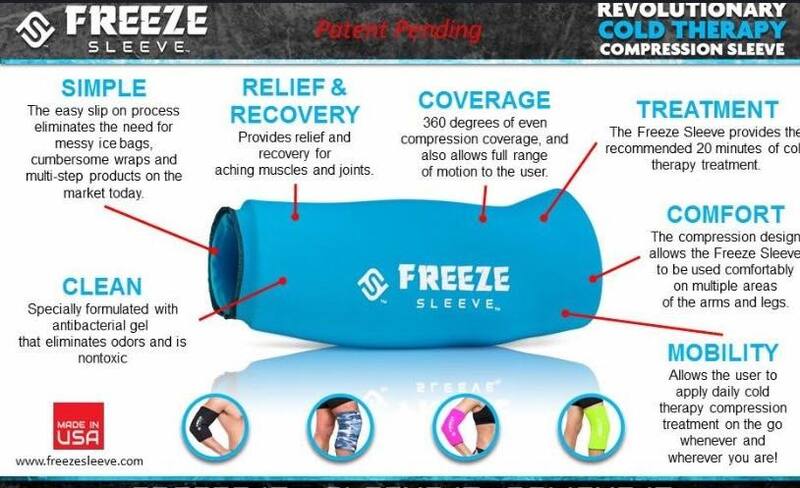 The Freeze Sleeve naturally contours to your body, allows a full range of motion, and won’t burn or damage your skin. It’s even formulated with an anti-microbial gel to prevent odors. Excellent stretch and coverage for this sleeve. Material is comfortable. Sizing is accurate and so much easier to use—no sliding cold packs or need for ties to keep in place. Plastic bag is a bit difficult to open—am always afraid that I will tear it. Great alternative to using the old fashioned bag of ice especially if you want to move around during treatment. The cold temperature does last the recommended 20 minutes so you don't have to worry about over doing it. It’s great to get compression and ice in one product. My elbows hurt from weightlifting, and the freeze sleeve is a tremendous help. An unexpected benefit is you can do other things instead of just sitting around holding and ice pack. Great quality I use mine multiple times daily and they hold up well. So much better than your typical ice pack & recovering systems. All the same benefits but none of the hassle! Just stick it in the freezer then slip it on your arm or leg. No ice, no condensation, no leaking water. Great product!